I do love OPI nailpolishes – I just haven’t been able to justify their price lately for the full-sized polishes, which is where the mini collections can be great! 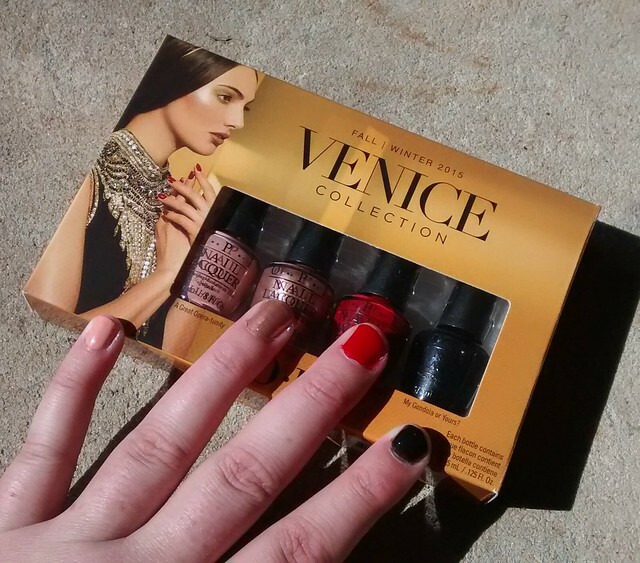 The Venice collection (for US Fall/Winter 2015) comes with a Peach (A Great Opera-tunity), Copper (Worth a Pretty Penne), Red (Amore at the Grand Canal) and Black (My Gondola or Yours?). The black was a little thin so needed 4 coats to be opaque, but lasted well with a nice shine. The copper and red are gorgeous, I have the copper on my toes right now! The peach was nice and opaque and dried super-fast. Not my colour, but a good peach for you blondies out there. What colour are your nails at the moment?